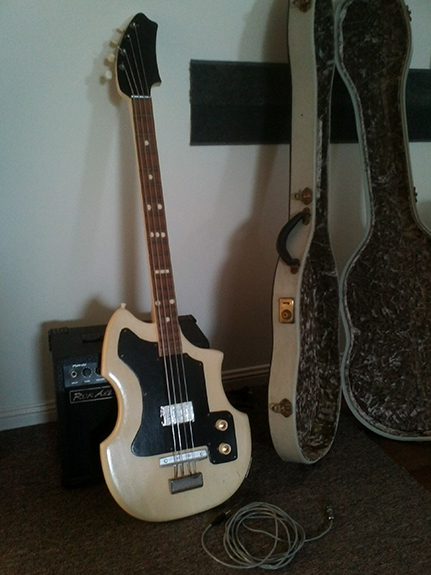 A great story on a 60′s home made bass, based on Maton’s Big Ben Bass. I received a fantastic email this week from Tony in Tasmania, who mentioned he had a home made Maton Big Ben that he’d built in the 60′s and asked if it’d be the type of story that would be interesting for guitarnerd. A home made Maton from the 60′s?! Yes please. Thanks to Tony for the great story and photos. The bass is an absolute beauty. The band name was The Black Diamonds in Hobart (Tas) we used to play most Friday nights at local pubs, esp the Aberfeldy Hotel. I guess we did a lot more as well – the memory fades – I’m 71 this year. I had to leave the band early due to studying for my Medical Imaging career (from which I have just retired). Both Leo and Stuart have red Maton Flamingos – Bill’s guitar is some sort of Ibanez issue, I think. He got it from Tony Tapp ( a great lead guy at the time). 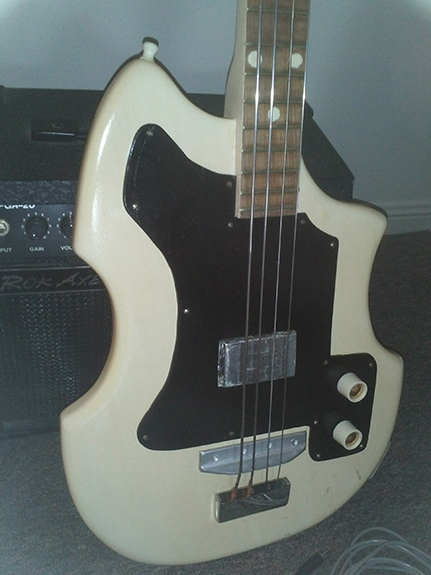 In our early years of mucking around with converted acoustics and whatever, I got the opportunity to play another home made bass from a mate whose name eludes me right now – it was a monster of a thing; no idea of the style copied – and this is where I got the incentive to build my own. Took about 6 to 12 months all up as I had no proper tools. I first saw a real Big Ben bass being played in a rock band from one of the visiting Navy warships and it sounded great.When I saw the same Big Ben in a local music shop in Hobart, I took some paper in one day and asked if I could trace out the shape as I wanted to make my own and for some strange reason, the guy let me do it! After I got the shapes cut out and assembled – rather unconventionally – and got the electronics sorted out, I went back to the shop and asked the same guy if I could get the precise measurements for the fret positions. This time re realised what he had done and put the infringing copyright issue on me and said “definitely not” !! So we all went in again later on, the boys got him busy up the other end of the shop while I took my time and carefully measured out the fret positions for the bass. Shop guy never knew! Body is Huon Pine with a Myrtle neck and head. 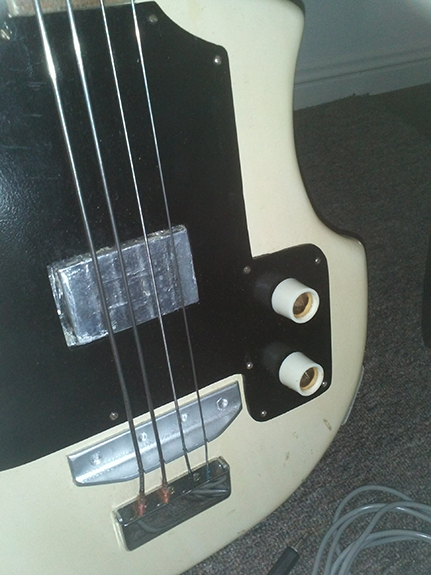 Couldn’t afford Bass machine heads at the time. Scratch plate is my design. Nut is a piece of aluminium from my Dad’s work shop. The bridge is a piece of angled aluminium painted silver. Strings held at the bridge by a discarded piece from another Ibanez guitar.The pick-up is hand wound around 2 square horse-shoe magnets from and old studio microphone. The pick-up cover is just a piece of special metalized paper from an Xray Radiographic film pack. Electronics are conventional parts. Lead is just some shielded speaker cable with standard jack plug one end and a mini on the other. All up cost was about $25 (at that time) most expensive parts were the flat wound strings and the case. I’ve still got the guitar (of course) and have only ever replaced one string. It still sounds good through a good bass amp. Love your story and your bass, Tony. I’m sure we’d love to see any other pix you have of the Black Diamonds with all those (real and not-so-real) Matons. Hey Guys – thanks for the comments – I hate to admit it, but I’m all thumbs with it at the moment. Itz been a while – but jeez she sounds good through an 80 watt Bass amp! lol – I’m actually in Brisbane, I probably mislead “tonyjackyl” with all the Tassy stuff. Been up here since 1974. He’s got another pick of the band, if you ask him he might put it up. I only ever managed to get two. 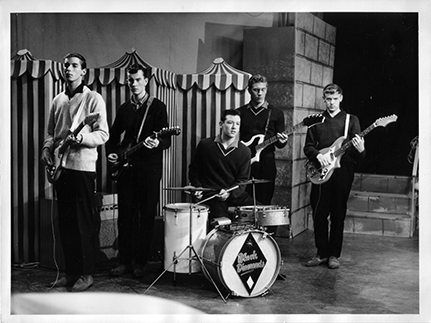 The one here is during a talent quest battle of the bands in the old TVT Channel 6 (at Derwent Park) – the unseen one is/was a promo shot. 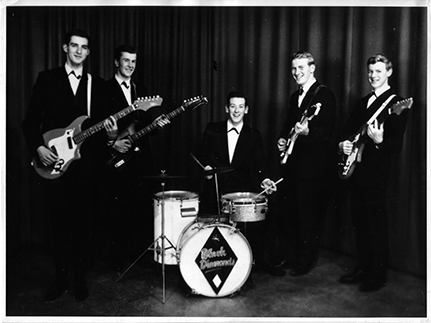 Hi Tony,I came across this sight by accident and was blown away to see these old photos of the band and myself 50yrs ago..We (Black Diamonds) still keep in contact and indeed will be having a dinner get-to-gether in February..If you ever come home to Tas you should get in touch we would love to see you……Kind regards.Ron. Great times at Sandy Bay Sailing Club with the Black Diamonds. Never forget a signature song ‘Gloria!’ Many people in very different walks in life today enjoyed those times. Any recordings available? 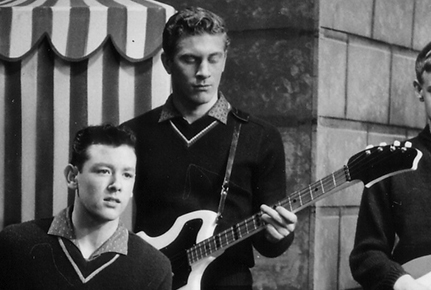 I played Bass with the Corvettes & during that time was a close friend of the boys particularly Stuart & Ron. Bill played lead for us for a while & Ron was our drummer for quite a while. I started off with a Maton Flamingo with the pegs drilled out & a set of bass strings,then I acquired an Echo Bass ex Titch Millhouse from the Kravats. I finished up with a Fender Jazz. I just found this tonight (16/9/18) and you triggered another memory for me – probably the biggest thrill of my early band life was when Noel Best asked me to fill in for Titch Millhouse on a Thursday night gig at a dance night in one of the halls in New Town. The big challenge for me was, they were all reading music! and I was doing the *play by ear* bit. Hell of a great night, though. Cheers to to you all.